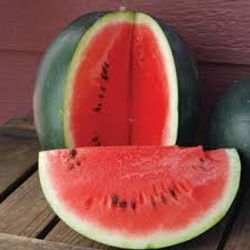 Who doesn't like a juicy bite of watermelon during the summer? There are three ways to tell when a watermelon is ripe. First, the tendril nearest the point on the vine where fruit stem attaches is browning or dead, second, the spot where the fruit rests on the ground is yellow and third, the classic mystery-you hear "punk" as opposed to "pink or "pank" when you flick the melon with your fingers. All transplants are certified organic. Select here for transplant information, pick up and order dates. An excellent northern, short season variety that produces yields of 6-12 lb. perfectly round fruits ranging from 7-8.5 inches in diameter. Fruits have solid green rind and deep red flesh. Flavor is sweet and juicy. This the standard for small watermelons.